Marine litter is nowadays commonly observed in any part of the oceans around the globe. In 2005, the United Nations Environment Programme estimated that approximately 6.4 million tons of litter are disposed of in the oceans and marginal seas each year. About 8 million items are dumped on a daily basis, of which approx. 5 million are deliberately discarded overboard or lost from ships. It has been estimated that over 13,000 pieces of plastic litter are floating on every square kilometre of ocean surface (UNEP, 2005), but only a small fraction remains there: 70% accumulates on the seafloor, 15% can be found in the water column and a further 15% is deposited along shorelines (Werner, 2010). With respect to the global problem of marine litter, several political programmes (e.g. the UNEP/MAP plan on Marine Litter or the Marine Strategy Framework Directive MSFD for European Countries) have been set up both on a global and regional scale to tackle the problem of marine litter pollution. These programmes primarily aim to achieve a good environmental status by preventing and reducing marine litter to a minimum and limiting its environmental and socioeconomic impacts. The MSFD requires all European member states to define a good environmental status of the relevant water bodies, i.e. rivers, estuaries and coastal waters. Therein, descriptor 10 instructs that “properties and quantities of marine litter [should] not cause harm to the coastal and marine environment” (2010/477/EU). The directive also implies that marine litter should not lead to negative socio-economic impacts. In 2010, OSPAR Ministers declared: “We note that quantities of litter in many areas of the North-East Atlantic are unacceptable, and therefore we will continue to develop reduction measures and targets, taking into consideration an ambitious target resulting in a reduction in 2020” (Bergen Statement; OSPAR, 2014). 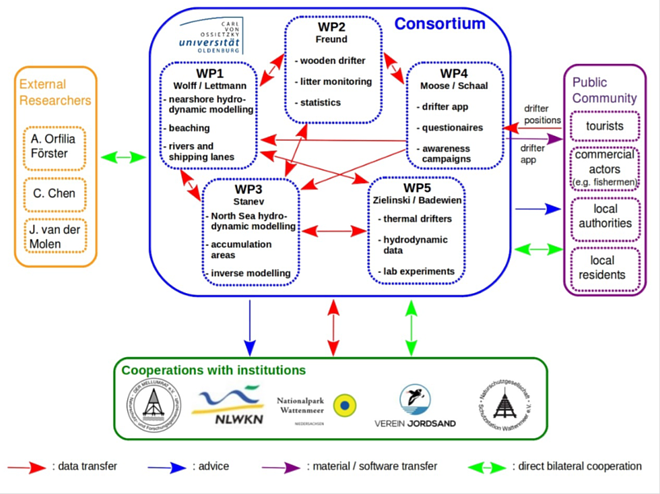 In order to contribute to this target within the southern North Sea, an interdisciplinary consortium of physical oceanographers, geoecologists, biologists, and environmental planners was formed. It will employ numerical modelling techniques, field work and monitoring strategies, as well as modern approaches of citizen science to clearly identify major sources of plastic pollution (e.g. shipping lanes, rivers, tourism) within this region. The consortium will also focus on the socio-behavioural patterns of relevant stakeholders in regard to littering. The findings of this project will provide local governmental and non-governmental entities with sound scientific data on macroplastic pollution, solid knowledge of major sources, pathways and accumulation areas of marine debris, and will also provide plans for abatement strategies. The region studied in this project will encompass the coastline of Lower Saxony, using new monitoring and modelling strategies, but also the larger river systems Ems, Weser and Elbe as well as the open German Bight with its waterways, from the Channel to the northern North Sea. The study area has a comprehensive spatial range due to the special emphasis placed on the existing marine litter monitoring programs and data sets of regional NGOs (Mellumrat, Verein Jordsand and Schutzstation Wattenmeer) and the NLWKN (Niedersächsischer Landesbetrieb für Wasserwirtschaft, Küsten und Naturschutz, i.e. the Lower Saxon State Department for Waterway, Coastal and Nature Conservation), which cooperate with the project consortium.